Stainless steel pull ring handle，is made of stainless steel,Widely used in wardrobes, kitchen cabinets, sliding doors, furniture, etc. 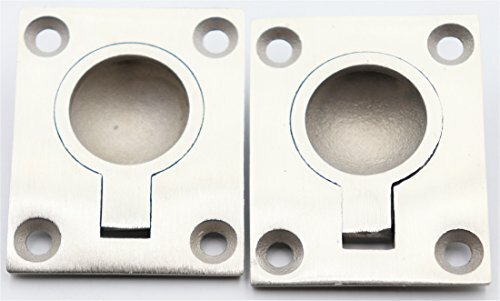 Material: 304# stainless steel, specification (length × width × height): 48X38mm small pull ring (38mmX30mm × 11.5mm), thickness: 2.5mm, weight:Small pull ring about 45 grams,surface treatment: sanding.One specifications, 2 each, a total of 2pieces.Manual measurement, dimensional deviation! Stainless steel pull ring handle, the pull ring handle adopts a concealed design. When not in use, the pull ring folds into the product plane, which does not affect other, beautiful and practical. The product is made of stainless steel, which is durable and beautiful. The product is equipped with screws for easy use. Widely used in wardrobes, kitchen cabinets, sliding doors, furniture, etc. If you have any questions about this product by LBY, contact us by completing and submitting the form below. If you are looking for a specif part number, please include it with your message.